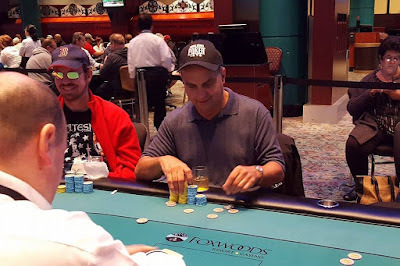 On a board reading K♣5♦3♦ John Caputo announces that he is all in from the small blind, and Jeremy Meacham shoves over the top in the hijack. Joseph CCurtain goes into the tank on the button and after two minutes, mucks his cards. "You are ahead for now," Meacham says as he turns over 6♦4♦for the straight flush draw. Caputo shows 5♣ 3♥ for two pair. The turn is the J♦ giving Meacham the flush, and when the board fails to pair on the river Caputo is eliminated in 5th place.